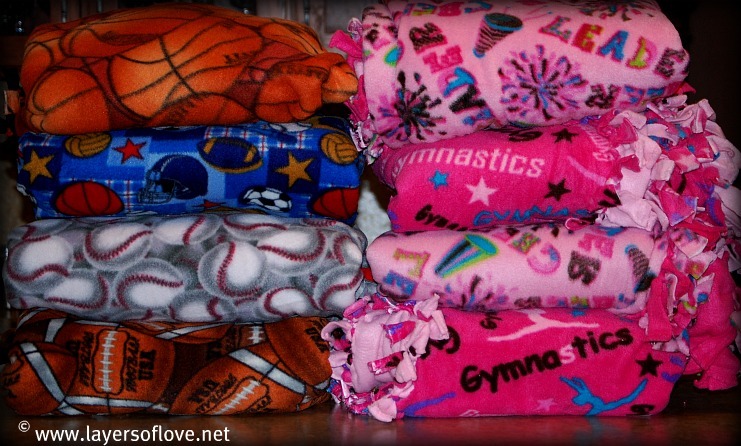 Today, Layers of Love is proud to announce that we are now working hard to collect brand new fleece blankets to donate to our friends at the Isaiah Alonso Foundation. The Isaiah Alonso Foundation is a public charity that was founded in memory of 6-year-old Isaiah Alonso. Isaiah collasped in front of his parents in September 2010 and was rushed to the hospital. He suffered severe brain damage from complications of lymphoma. The lymphoma was not diagnosed until that day. He never regained consciousnesses and passed away soon after. Isaiah loved to wear superhero costumes and loved to dance to Michael Jackson songs. The foundation also has a gift shop where you can purchase wonderful merchandise to help them in their mission to help children who have cancer. The Foundation is also on Facebook so be sure to stop by their page and “like” them. We are very happy to be collecting blankets, and look forward to a very long relationship with the Isaiah Alonso Foundation, It is our hope to be able to deliver enough blankets to give to every child who is battling cancer, to provide them with comfort and warmth as they go through their treatments. With the holidays fast approaching, this is the perfect time to think about donating a child-sized blanket. If you have a fleece fabric you would like to donate, you can contact us here in the comments or at: donations@layersoflove.net We accept brand new fleece fabric and no sew fleece fabric kits (available at many craft stores). Don’t have the time or not sure how to put a kit together? No problem, we can put the kits and fabric donations together for you. Not sure about sizing or measurements? We invite you to take a moment to look at our FAQ tab and Guidelines tab above this post to see our recommendations for donating child-sized blankets. This entry was posted in Donations and tagged blankets, cancer, chemotherapy, child, Children, comfort & warmth, Donations, fabric, fleece, foundation, Isaiah Alonso Foundation, pediatric. Bookmark the permalink.